Did you know that there is an athlete in the Feline Pawty? No, I don't mean me, even though I am quite expert at jingle balls. 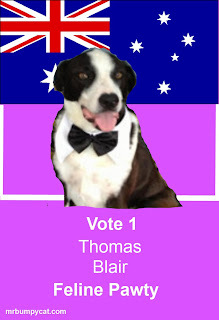 I'm talking about Thomas, the candidate for Blair in Qld. When you look at his campaign poster, you see a very sophisticated dog in a bow tie. But he's not always in formal attire. When he's not out on the campaign trail, Thomas is a Frisbee champion. In fact, he's never met a Frisbee he didn't want to chase. 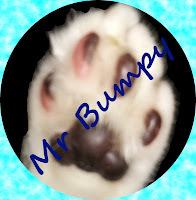 He even has glow-in-the dark Frisbees and has trained his human to throw them at night. Given that he's such an athlete, I think I'll make him Minispurr for Sport and Recreation. I think having someone who's an expert at sensible sports like Frisbee will make a nice change from the strange national obsession with human games. Perhaps he could help solve the problem of unhealthy, overweight, humans, by teaching other dogs how to train their humans to play sports, or even to go for walkies. If dogs could train their humans to become active it would help with the health budget as well. Well, that's a big job, but Thomas is up to it. He's a champion athlete after all. Keep up-to-date with all the Candidates at Campaign Central.